Atoms usually have the same numbers of protons and electrons. 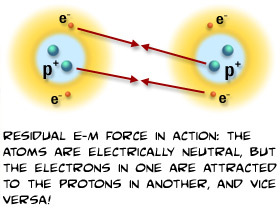 They are electrically neutral, therefore, because the positive protons cancel out the negative electrons. Since they are neutral, what causes them to stick together to form stable molecules? The answer is a bit strange: we've discovered that the charged parts of one atom can interact with the charged parts of another atom. This allows different atoms to bind together, an effect called the residual electromagnetic force. So the electromagnetic force is what allows atoms to bond and form molecules, allowing the world to stay together and create the matter you interact with all of the time. Amazing, isn't it? All the structures of the world exist simply because protons and electrons have opposite charges! See? Now you know the meaning of life!